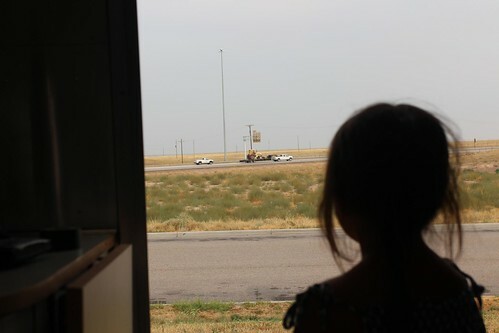 Mali Mish - Day 28: From Colorado to Cheyenne, Wyoming. Instead of driving up Interstate 25 from Denver, we decided to drive the smaller roads along the foothills towards Boulder. It is our consolation prize for leaving Colorado today. At least we get to stop at Boulder for a quick bite and maybe some shopping. After a quick bite at a Moe’s Original BBQ and some stocking up at the Sprout’s market next door, we headed to the Boulder 29th street mall. Why do you ask? Well, there is an Anthropologie at this mall and since we have been on the road for nearly a month, Marlene needed to get her fix. 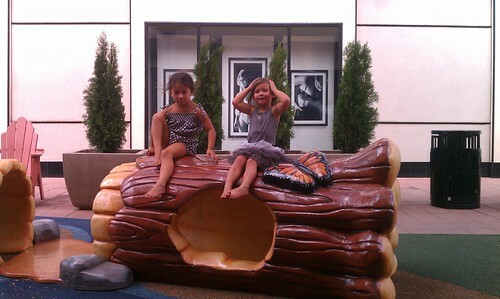 I stayed with the girls at the playground of the open air mall while we waited for Marlene to shop. As we were leaving, the unthinkable happened: Mila forgot her stuffed owl, Chuk, at the playground. If you have ever met Mila, you’d know that she and her Chuk are inseparable. Except she likes to put her down at random places when she plays, forget about it and ask us for her later. We are usually pretty good about picking it up and stuffing her away but this time, we forgot. We left the mall, did a bit more shopping at the Target nearby and drove on our merry way towards Wyoming. 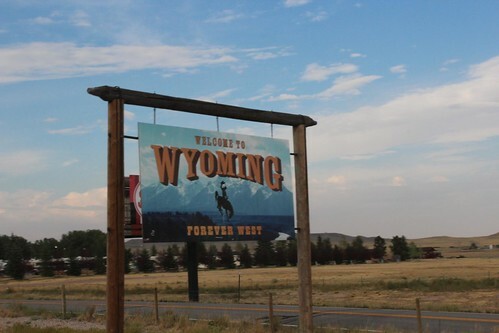 We have no idea what to expect in Wyoming. All of the cool places people go to are to the west of us. We didn’t want to backtrack to eat up our precious late summer, early fall window of opportunity in this area. The next biggest town is Cheyenne and right as we entered the outskirts of town, we pulled into a Flying J Truck Stop to spend the night. 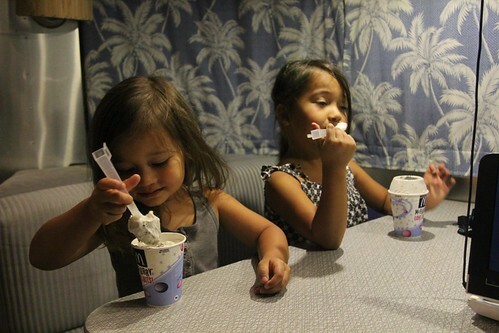 This is where Mila asked us about her Chuk. This is where we had a moment of panic when we couldn’t find her. At the time, we did not know exact where she had left her so we ended up calling the Starbucks in Boulder by the 29th Street Mall and got someone there to go check the playground. Luckily for us, it was still there. It is almost 100 miles to drive back to Boulder to get it, but believe me, I thought about doing it. Fortunately, the manager agreed to ship it to us with a gentlemen’s agreement that we would leave an extra tip for the next Starbucks barista. Done and done. We parked at the edge of the parking lot where all of the big rigs are lined up thinking that we wouldn’t be surrounded by running diesel engines all night long. 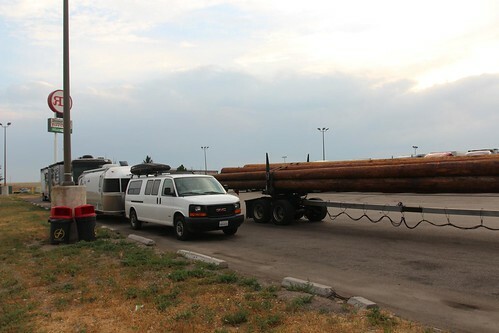 What we didn’t consider is that long loads such as this guy carrying timbers would also want to park here. 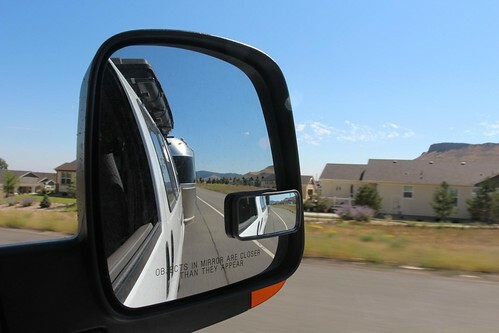 He decided that parking next to me, while a class A RV was already behind me and another travel trailer was in front of me and essentially blocking me in, was a good idea. Luckily for us, we didn’t have any emergencies that required us to flee the truck stop in the middle of the night. 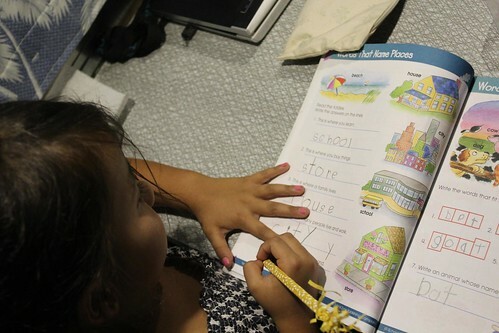 Since it was a Thursday, I had work to do and Ava has school with teacher Marlene. We are looking at another long transit day tomorrow so we will just relax for the night. 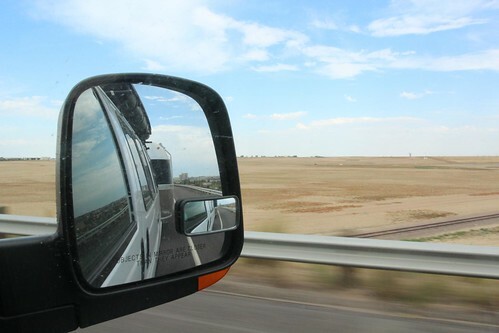 5 Responses to Day 28: From Colorado to Cheyenne, Wyoming. We really enjoy every blog you guys post and read them avidly everyday. Just wondering, do you use iPad apps to find restaurants? (All your restaurant finds are wonderful!) If so, which apps do you use the most on the road? But we have a hard time finding truly great local restaurants. Any tips for us and any others who might benefit by your guidance? Hi Thomas, thanks for the kinds words! Yes, GasBuddy is a great app! In fact, I used it to find diesel that was almost 40 cents cheaper per gallon in Cheyenne than the Flying J! We do like our food, too and we actually don’t use anything specific to find restaurants. Sometimes it is a recommendation from a friend of acquaintance and other times we will just drive by a few and pick one that looks promising. If we are in a town for awhile, we will look up a few places from the usual recommendation websites like yelp, google local (zagat) and some others. I’ve lost a bit of faith with the reviews on yelp in the last couple of years with some scandal about them allowing the owners to pay to have bad reviews removed. Whether that is true or not, I don’t know but some of its recommendations have been subpar. The story of getting back the Chuk is so touching. I realize that it was partially for self-preservation, not wanting to have a crying child for the next few days. But it was also to comfort Mila and prevent the pain she would have experienced without her pacifier. The lengths that you went to and the cooperation of the Starbuck’s manager and the truck driver were astonishing. Thanks for sharing this poignant moment. Debbie just told me the “Chuk” is a doll not a pacifier. I stand corrected. The sentiment remainsthe same. Check out a couple more apps: iExit and Roadahead.